Harold Barefoot Sanders Jr. (February 5, 1925 – September 21, 2008) was a longtime United States District Judge of the United States District Court for the Northern District of Texas and counsel to President Lyndon B. Johnson. He was best known for overseeing the lawsuit to desegregate the Dallas Independent School District. Sanders was born in Dallas, Texas to H.B. Sanders, and the former May Elizabeth Forrester. "Barefoot" was the maiden name of his paternal grandmother, Dennie Barefoot. Early in his life, Sanders went by "H.B." He graduated from North Dallas High School in 1942. He served in the United States Navy during World War II between 1943 and 1946. While attending the University of Texas, Sanders was elected student body president in 1947. He was affiliated with Phi Delta Theta, Blue Key, Phi Delta Phi, Phi Delta Kappa and the Texas Cowboys. Sanders received a Bachelor of Arts degree from the University of Texas at Austin in 1949, and a Juris Doctor in 1950 from the University of Texas School of Law. He was in private practice with the Dallas law firm of Clark, West, Keller, Sanders and Butler from 1950 through 1961 and from 1969 until 1979. A Democrat, Sanders served in the Texas House of Representatives from 1953 to 1959. During his tenure in the Texas Legislature, he sponsored the Texas Securities Act, the Texas Probate Code, the Texas Mental Health Code, and legislation creating the Trinity River Authority. In 1958, Sanders ran for United States Representative from the 5th District of Texas, but lost in the general election to Republican incumbent Bruce Alger. LBJ called Irving Goldberg from the plane and asked, "Who can swear me in?" Goldberg called me, and I said, "Well, we know a federal judge can." Then I got a call from the president's plane, with the command "Find Sarah Hughes." Coincidentally, Judge Hughes, Jan [Judge Sanders's wife] and I were supposed to go to Austin that night for a dinner for President Kennedy. I reached her at home and said, "They need you to swear in the vice president at Love Field. Please get out there." She said, "Is there an oath?" I said, "Yes, but we haven't found it yet." She said, "Don't worry about it; I'll make one up." She was very resourceful, you know. By the time she got to the airplane, someone had already called it into the plane. We quickly realized that it is in the Constitution. From 1965 to 1967, Sanders served as Assistant Deputy Attorney General and Assistant Attorney General in the United States Department of Justice in Washington, D.C. and was instrumental in the passage of the Voting Rights Act of 1965. 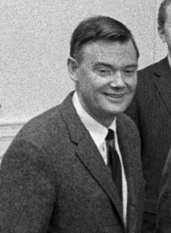 In 1967, President Lyndon Johnson appointed him Legislative Counsel to the President to manage the White House legislative program. In 1968, Johnson nominated Sanders to a seat on the United States Court of Appeals for the District of Columbia Circuit. Johnson's presidency ended before the United States Senate cast a vote on Sanders' nomination, and President Richard Nixon did not renominate Sanders. Nixon appointed George MacKinnon to that seat instead. In the 1972 Democratic primary, Sanders faced former Senator Ralph William Yarborough of Austin for the right to challenge two-term incumbent Republican John G. Tower in the general election. Yarborough had lost his seat in the primary in 1970 to Lloyd M. Bentsen of Houston. The established leader of the Texas liberal Democratic faction, Yarborough nearly won on the first ballot, but Sanders received enough votes to force him into a runoff. In the second primary, Sanders prevailed, 1,008,499 (52.1 percent) to 928,132 (47.9 percent). In the general election campaign, Tower attempted to link Sanders, also considered a liberal by Texas standards, with the Democratic presidential nominee, then-U.S. Senator George McGovern of South Dakota, who was waging an uphill challenge to Richard Nixon. In his memoir, Consequences: A Personal and Political Memoir, Tower recalled: "I linked Harold Sanders to McGovern whenever I could. I hung Attorney General Ramsey Clark around his neck. Clark was an old associate of Sanders's and had made a $2,000 contribution to the Sanders campaign. 'I'm glad,' one of my standard zingers went, 'that Ramsey Clark is supporting my opponent, an old crony of his. . . . Frankly, I don't welcome the support of anyone who goes to Hanoi and condemns our country.'" In the campaign, Tower prevailed by 311,000 votes, the high-water mark of his electoral career. Tower received 1,822,877 votes (53.4 percent) to Sanders's 1,511,985 (44.3 percent). Six years later in 1978, Tower edged the Democratic United States Representative (later appointed Senator) Bob Krueger by only 12,227 votes. On February 6, 1979, President Jimmy Carter nominated Sanders to a new seat on the United States District Court for the Northern District of Texas created by 92 Stat. 1629. He was confirmed by the United States Senate on April 24, 1979, and received his commission two days later. Sanders served as Chief Judge of the Northern District of Texas from 1989 to 1995. During his tenure as a federal district judge, Sanders held many positions on committees related to the function of the judiciary. He served as Chair of the Judicial Conference Committee on the Judicial Branch (1994–97); as a member of the Judicial Panel on Multidistrict Litigation (1992–2000); and as Chair, National Conference of Federal Trial Judges, American Bar Association (1988–89). He assumed senior status on January 1, 1996. Sanders took inactive senior status on July 7, 2006. His service was terminated on September 21, 2008, due to his death. Though Sanders handled thousands of civil and criminal cases during his tenure as a Federal Judge, he is best known in Texas for his role as judge in the Tasby litigation brought against the Dallas Independent School District in the 1970s, in which plaintiff Sam Tasby charged that the Dallas ISD was still a segregated school district. The litigation began before Sanders became a federal judge, but he took over the case until its conclusion in 2003, and had oversight of many Dallas ISD activities related to racial balance until that time. Though the Tasby litigation was not the first desegregation lawsuit against Dallas ISD, it is the most famous. Until 1961, Dallas was the largest city in the South with a segregated school system. That same year, the Dallas ISD school board implemented a desegration plan — the so-called "Stairstep Plan" — under order of the Fifth Circuit Court of Appeals. In September of that year, eighteen black students started first grade classes in what had been whites-only institutions. In spite of tremendous dissatisfaction with Dallas ISD and continual complaints by the Dallas NAACP, Dallas ISD declared itself desegregated in 1967. Litigation that continued for three more decades proved that declaration inappropriate. Sam Tasby filed a lawsuit against Dallas ISD charging discrimination prohibited under Brown v. Board of Education on October 6, 1970. Federal Judge William M. Taylor presided over a trial of the case from July 12 to July 16, 1971, and ordered the school district to come up with a new desegregation plan, which the district published on July 23, 1971. Four years later, in July 1975, the United States Court of Appeals for the Fifth Circuit rejected several parts of the plan and ordered a new desegregation plan implemented by January 1976. Other parties, including the NAACP, were added to the suit. On February 2, 1976, Judge Taylor presided over a second desegregation trial, and by April, a new desegregation plan was issued. The Fifth Circuit rejected most of this plan as well. The most controversial part of this plan centered around busing, and Judge Taylor held an additional hearing on the case. Taylor removed himself from the case on March 21, 1981, to "avoid any further possibility that a desegregation plan might be overturned," and the case was assigned to Judge Sanders. This Judgment constitutes the Desegregation Plan for the Dallas Independent School District ("DISD" or "the District") and is rendered pursuant to, and is to be construed in the light of and consistent with, (1) the Court's Memorandum Opinion dated August 3, 1981; (2) the Stipulation dated December 1, 1981, and approved by the Court on December 2, 1981; and (3) the Court's Memorandum Opinions and Orders dated December 7, 1981; December 21, 1981; January 4, 1982; and February 1, 1982. This Judgment supersedes the final judgment rendered by this Court in 1976. All programs provided for in this Judgment must be initiated by the beginning of the DISD 1982-83 school year, or sooner if feasible, unless otherwise herein provided. The school district fought Sanders decision until August, 1983, when the Fifth Circuit upheld Sanders' plan; at that time, the Dallas ISD board of trustees unanimously accepted the court's decision. Decades of oversight finally came to an end in June 2003, when Sanders ruled that Dallas ISD was no longer subject to his oversight and was desegregated. Sanders's work in the desegregation case made him the occasional target of hostile telephone calls and letters. He once said that Dallas was accustomed to segregation, and many whites were content with the status quo. During the summer of 2009, Sanders was honored by the Dallas ISD when the Board of Trustees renamed the School of Government, Law, & Law Enforcement to Judge Barefoot Sanders Law Magnet. Sanders was married to the former Jan Scurlock. He and his wife had four children. His oldest daughter, Janet, is a Superior Court Judge in Massachusetts. ^ Holley, Joe (29 September 2008). "Barefoot Sanders; Tex. Political Figure And Federal Judge". Washington Post. Retrieved 24 October 2017. ^ a b Harold Barefoot Sanders Jr. at the Biographical Directory of Federal Judges, a public domain publication of the Federal Judicial Center. ^ a b "Page Not Found" (PDF). www.abota.org. ^ Goldman, Sheldon (1997). Picking Federal Judges. Yale University Press. p. 187. ISBN 0-300-06962-6. ^ Dallas Blog website[permanent dead link]. ^ "Desegregating Dallas schools : the litigation archives". SMU.edu. Archived from the original on 2015-03-19. ^ "Judge Barefoot Sanders Magnet Center for Public Service at Yvonne A. Ewell Townview Center – School History". Harold Barefoot Sanders Jr. at the Biographical Directory of Federal Judges, a public domain publication of the Federal Judicial Center. This page was last edited on 13 April 2019, at 19:41 (UTC).